Now I am registered for Math League Adaptive Learning System. How can I register my students? How can I get my students to use Math League Adaptive Learning System? Why should I create a class and how do I create a class? My class has been created. How can I enroll my students in my class? My class has been created. And I have enrolled my students in my class. Now how can I assign homework, i.e. contests, to my students? I created a class, enrolled my students in the class, and assigned homework, i.e. contests, to my students. Then how do my students work on the homework, i.e. contests? How can parents participate in their children's learning process? How much does it cost to use the system? Is there a sample contest? Although I have almost 60 students enrolled in my 4th grade class, when I click on "Login Names and Passwords", it tells me there are no students enrolled. My students began to use the Math League Adaptive Learning System last year when they were in 6th grade. Now they are in 7th grade. How do I upgrade their class to 7th grade? Our school has bought access to Math League Adaptive Learning System for 4th and 5th grades. Whether or not one school teacher is responsible for all the 4th and 5th graders and access to the system is through that one teacher, or if every 4th and 5th grade teacher (there are three 4th grade teachers and three 5th grade teachers) can each go online and create an Instructor's account for their class? Can one class have multiple instructors? If so, how do I assign multiple instructors to a particular class? One of my students has problem logging into the system. What can I do? The three steps to register your students and get them to use Math League Adaptive Learning System are listed below. Please note while we strive to streamline the first two steps, creating a class and enrolling your students in your class, some people still find it fairly complicated doing this in the system. Instead we encourage you to send us (email: INFO@LTHOUGHTS.COM) an Excel sheet with your student names and grade levels. We will process it for you and inform you once it is done. It will be done within 24 hours. Click here to download a sample Excel sheet. Step 1: Create a class. See detailed description below. Step 2: Enroll your students in your class. See detailed description below. Step 3: Assign homework, i.e. contests, to your students. See detailed description below. For your students to use Math League Adaptive Learning System, you need to create a class and enroll your students in your class. This is how the system was designed. To create a class, please log in to the system using your account (teacher's account), and go to page "My Home." 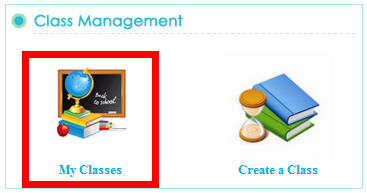 Click on "Create a Class" under "Class Management." Step 1: Log in to the system using your account (teacher's account), and go to page "My Home." 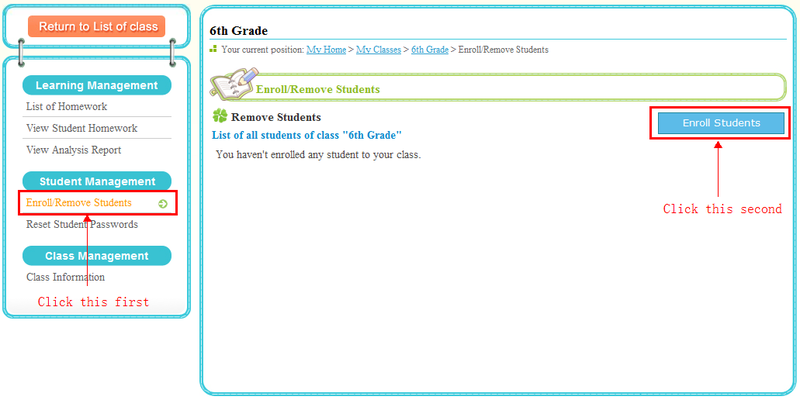 Click on "My Classes" under "Class Management." Step 2: Go to my class. Step 3: Click to enroll students. There are three occasions to enroll your students in your class. There are three cases why the students you wish to enroll in your class already have their accounts in the system. Another case is that these students were created by you previously and were in some other class of yours. The last case is their parents created their accounts for them. You use their existing accounts so their parents can get involved and know their children's performance at school. This facilitates parents to participate in their children's learning process so they can better understand and assist their children. (3) Or you can simply send us an email, INFO@LTHOUGHTS.COM, and we will do it for you in the back end. In your email, please specify your class title and the name list of your students, which can be in an Excel file. Note: If the students you wish to enroll in your class already have their accounts in the system, please specify their account names as well. The students you will enroll in your class already have their accounts in the system. You have two options, Option 1: "Pick from my student list" and Option 2: "Enter student login names (including username and domain)." The students you will enroll in your class do not yet have their accounts in the system. 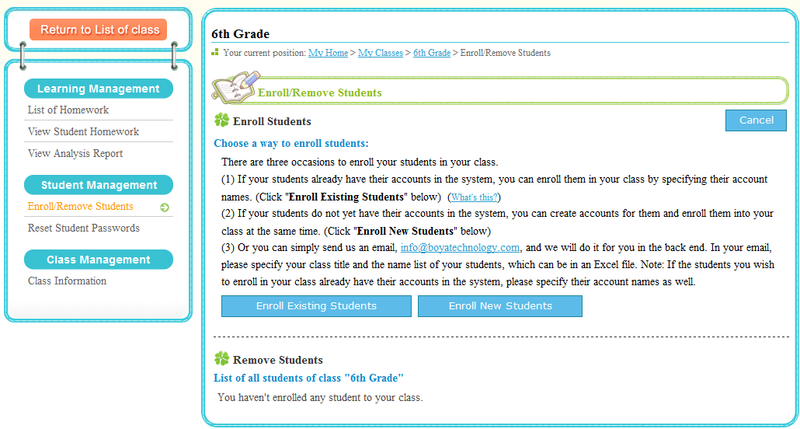 You can create accounts for them and enroll them in your class at the same time. 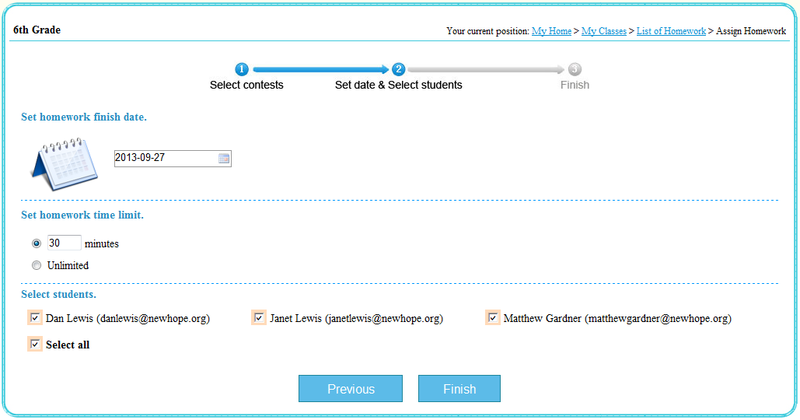 You can enter student names directly on the enrollment page or upload student names from an Excel file. If you have more than a handful of students to enroll in your class, the best way is to upload student names from an Excel file. 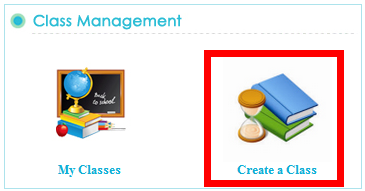 Step 2: Click to assign homework. 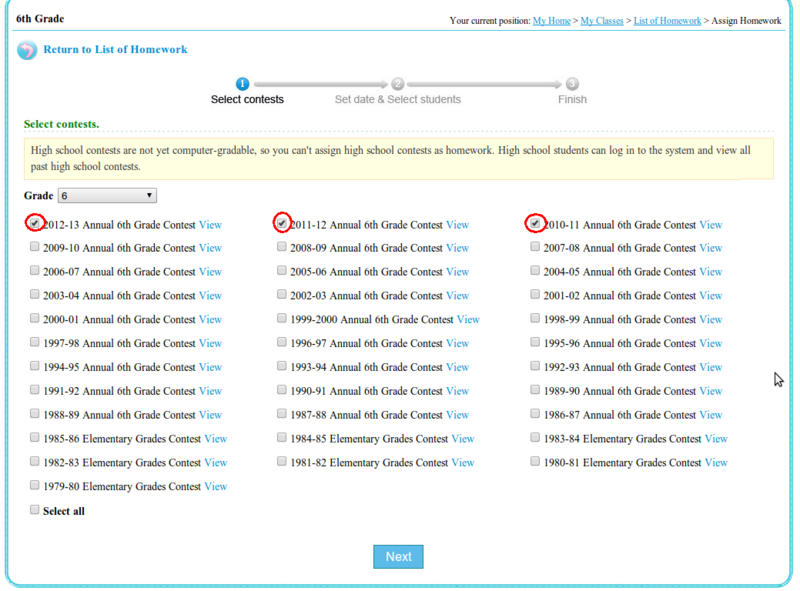 Step 4: Set finish date and select students. Click to Finish. Step 1: First you need to give the login names (including username and domain) and passwords generated by the system to your students, so they can log in the system and work on their homework, i.e. contests. 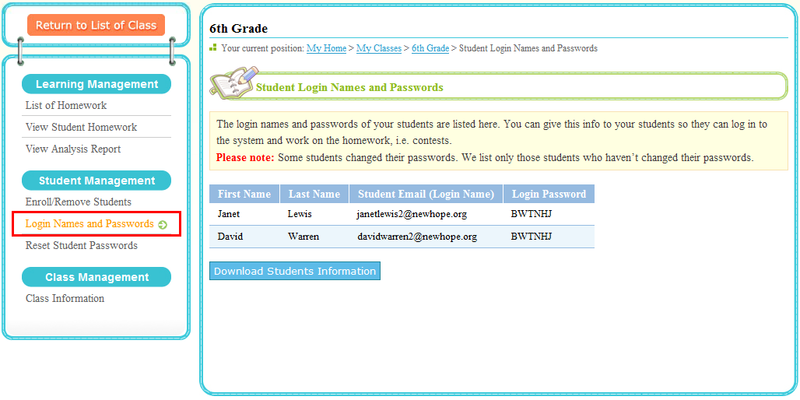 Step 2: Your students can now log in to the system, http://online.mathleague.com. After your students log on to the system, they need to go the class you created for them to work on their homework, i.e. contests. Once you register your students for Math League Adaptive Learning System, they can log in to the system and work on the homework assigned by you. They can also help generate login accounts for their parents. So their parents can log in to the system, assign homework to their children too, and view the performance of their children. Thus the system facilitates parents to participate in their children's learning process so they can understand and assist their children along the way to accomplish goals. Teachers of all schools registered for any of our 2018-2019 contests can now enroll all your students of any selected grade (4 - 12) for $9.95 for use throughout this school year. For this $9.95 fee, all the students of the selected grade in your school can use the system. Yes, we offer seven sample contests for students, teachers, and parents. Some students changed their passwords. We list only those students who haven't changed their passwords. The simple answer is you can't upgrade their class to 7th grade. The reason is their 6th grade class is finished. It is saved in the system, along with its homework, contest scores, and etc. It becomes part of the historical data. If you really want to delete your classes, please send us mail, INFO@LTHOUGHTS.COM, and we will delete them for you. For this year, you still need to create a new class, for example, 7th grade class, and enroll your students in this new class. We know this is not most intuitive. Instead you can mail to us (INFO@LTHOUGHTS.COM) the following info, grade level and student names (in plain text or in an Excel file). We will create a new class and enroll your students in your class. You can have as many instructors as you like to use the Math League Adaptive Learning System. Each instructor can go online and create his/her own account for his/her class. Each instructor will be responsible for their own classes through the Math League Adaptive Learning System. That way they can monitor their own students and assign the practice as homework if they wish. So the work doesn't fall on one person's shoulders. And one class can have multiple instructors, who can work together on this class, see next FAQ. Question: Do the kids have access to the system at home using the login names and passwords generated by the system or do they purchase their own subscription? The kids can have access to the system at home using the login names and passwords generated by the system as long as they have Internet access. And their parents can participate in their children's learning process too, http://online.mathleague.com/faq/faqteacher.php#8. One class can have multiple instructors, who can work together on this class. To assign multiple instructors to a class, please send us an email, INFO@LTHOUGHTS.COM, and we will do it for you in the back end. In your email, please specify your class title and the login name of the instructors. Note: If the instructors you wish to assign to your class don't have their accounts in the system, please register first at http://online.mathleague.com/instructorreg.php. If it is because your student forgot her password, you can reset her password as follows. Step 2: Click to reset password. Step 3: Enter the new password. Click to submit. There are two kinds of "removing a student," removing a student from a class and removing a student from taking an online contest. The following figure demonstrates how to remove a student from taking an online contest. The following figure demonstrates how to remove a student from a class. Please note if a student is removed from a class, she/he will be automatically removed from the list taking online contests scheduled for the students of this class.